One of the biggest and most important design challenges of this project so far has been the cars. To my mind, they represent the noxious, polluting future of mass production, noisy and dangerous and the death of artisan craftsmanship. And yet... They are also described as shiny and majestic, an impressive and phenomenal piece of machinery that will ultimately be a game-changer to travel and industry. So, what the hell should they look like? 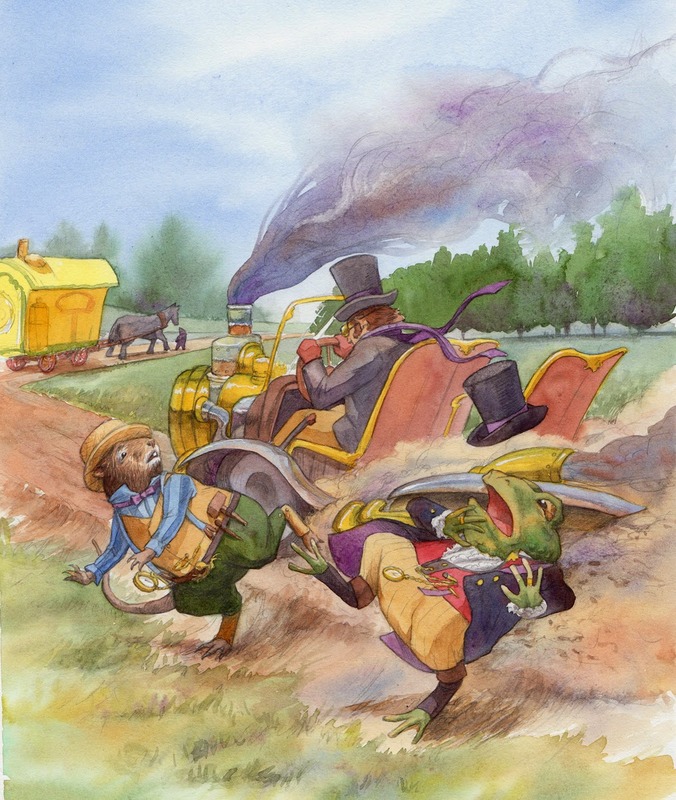 Way back in late 2011, when I was first pondering this idea, I made a few sample illustrations that included Mr. Toad stealing a car. 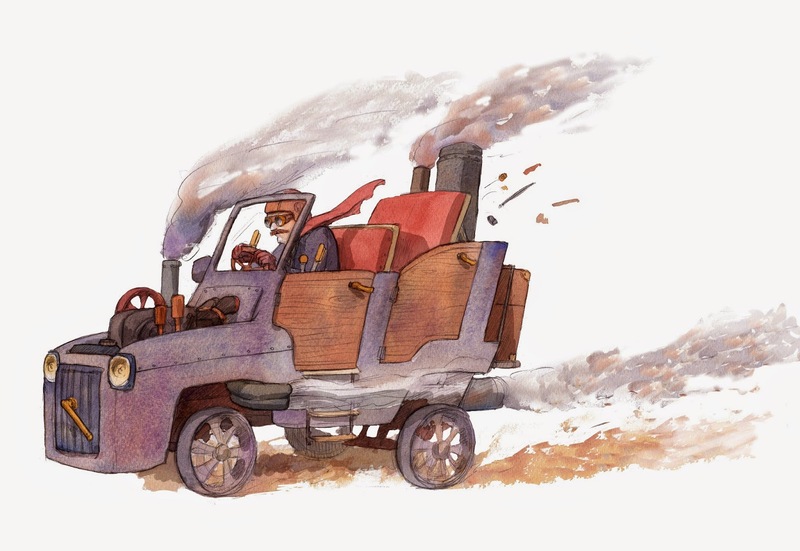 That first concept was of a steam-powered vehicle, a confection of brass and wood, as fanciful as it was pretty. Of course, at the time I was still playing around with ideas, and hadn't yet identified the importance of the artisan versus mass-production theme. 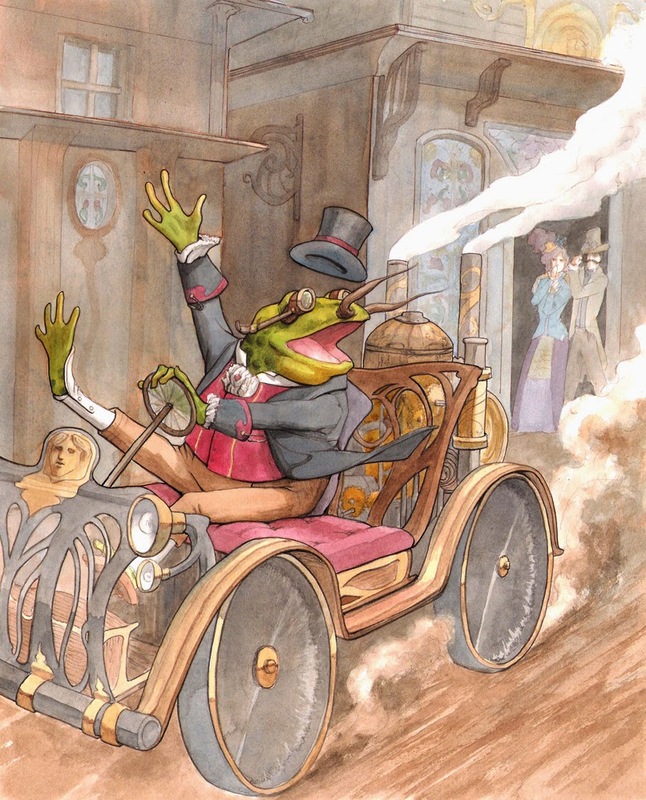 Toad was also dressed in more Victorian garb, which would later be replaced by a more modern, Edwardian-Hipster feel. All in all, it was a pretty piece of design, but it wasn't right. The next set of sketches and ideas came as I began working on samples for this project in earnest, in early 2013. By this stage I had it firmly locked in my mind that the automobile of Grahame's time was a nasty piece of futuristic technology, belching hatred and fire and environmental damage all over the lovely countryside. It should be an ugly thing of black iron and grease, spewing pollution and the nuts and bolts of poor manufacturing across every country lane. You may note that at this time the characters and flavour of the illustrations were still being settled; like all prototypes, there was still a lot of refining to be done. In the end I felt like I was being too hard on the car manufacturers: this last design looks like a coal power plant on wheels. Although they must be loud and huge and just a little bit obscene, they must still be glorious enough for Toad to become so desperately infatuated. I had to regain the "deep mahogany and shining brass details" of Grahame's description. At length I returned to my drawing books and found for reference the ideal mass-produced vehicle: Ford Model T. First produced around Grahame's era, Ford created a new method of production line that meant a Model T could be built in just 93 minutes, which was a staggering feat for the time. Clearly, when Grahame was imagining cars trampling all over his lovely countryside it was the Model T he was picturing. By itself, however, the Model T was a bit too quaint and charming for my mind, so I added to it the elements of its modern brethren that I feel are most wasteful and indulgent. The final design boasts a huge, partially exposed engine, multiple exhausts, front bumper, an obnoxiously loud horn, a rear spoiler and, just for that extra touch of hoon, racing stripes. 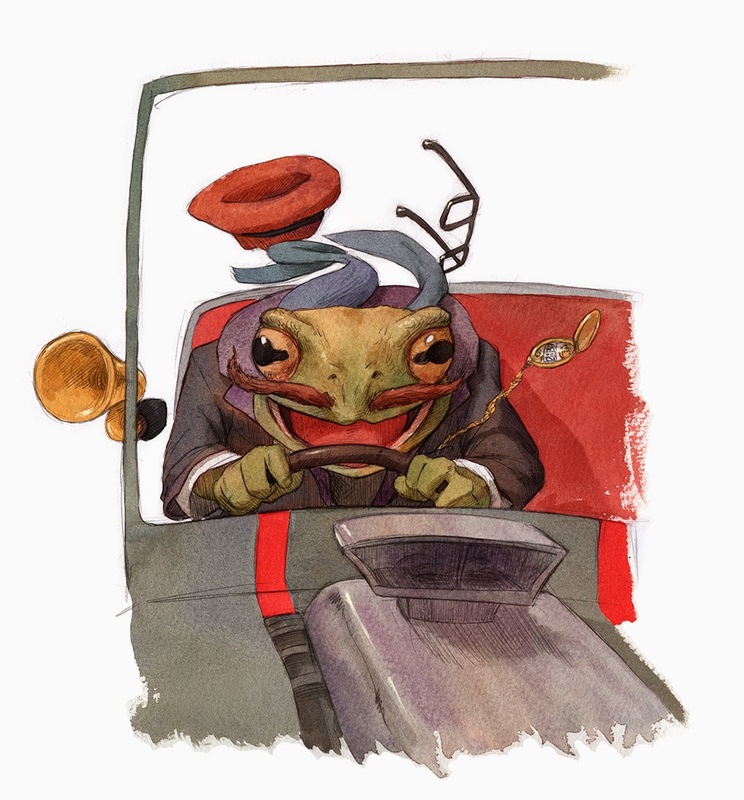 Here, at last, is a car Toad would thunder around the countryside in, and invariably use to crash into a hedge. But who cares about smashes when another one is built every 93 minutes? i collected at extra usefull messsages ... some procedures is see that .. every all information good levels ..its go search this.. Very nice your blog, thanks for more information. The Tirumala temple in Chennai is modelled when the additional famed and original Tirupati temple in state. An entire duplicate of the initial, this temple is visited by thousands United Nations agency are unable to travel up to Tirupati or exchange the curved queues there. Very nice your blog, thanks for more information. Natural Arch, Tirumala hills could be a distinctive earth science marvel settled zero.6 miles north of the Tirumala hills temple. The Arch is additionally referred to as Sila thoranam (శిలాతోరణం)in native Telugu language (Telugu language: “Sila” means that ‘rock’ and “thoranam” means that a garland set up over a threshold, connecting 2 vertical columns or associate ‘arch’ as during this case). The arch measures eight m (26.2 ft) in breadth and three m (9.8 ft) tall, and is of course fashioned within the quartzites of Cuddapah Super group of Middle to higher Proterozoic (1600 to 570 Ma) because of natural erosive forces. Your article is very nice, thanks for more information; we are sheared on One day Tirupati tour package from Chennai daily services, more contact for Chennai Car Travels. Very nice your article, thanks for more information. We are best and cheapest car rental in Chennai, we are daily provided for One day Tirupati tour package from Chennai, The package including for Car + Food + Dharshan ticket, morning pickup time 6.00 am and drop time 8.00 pm, more contact for Chennai car travels. Chennai Car Travels – One Day Tirupati Tour Package from Chennai Service offers best costs to the other web site on-line. We tend to swear that there's no different websites which supplies Tirupati Package from Chennai adequate our price. Show us the agency that affords Tirupati Package from Chennai at you price that is lesser than us and that we can beat it up by 100% less. Please check the value list for additional details. A lot of Hindu devotees from all walks of life throng Tirupati (The abode of Lord Balaji) everyday of the year. On a mean 35000 devotees visit each day and on competition occasions it goes up to even one.5 lakhs. In step with most Hindus a visit to tirumala is once during a life time would like. We tend to conduct target-hunting Chennai to Tirupati Packages and also facilitate in booking seeghra darshan tickets in on-line. Nice post keeps it up thanks for sharing one among the simplest travels in Madras, Chennai car Travels we tend to ar best provided for sooner or later Tirupati tour package from Chennai best provide for group package and additionally, a lot of details contact for Chennai car Travels. Nice post keeps it up thanks for sharing there are eleven sanctuaries called Mandapas, organized on the 2 sides of the slopes of Mahabalipuram. These sanctuaries area unit unbelievable case of Dravadian engineering. vital vacation destinations in Mahabalipuram area unit Panch Pandava Rathas, Shore Temple – found shores of Bay of geographical region this contains of a Hindu deity Temple and 2 Shiva Temples, Varaha Caves-shake cut caverns having icons of incarnations of Vishnu–Varaha, Mahishasuramardhini Caves, Somaskanda models and Arjuna’s Penance-is one amongst the best outdoors shake figures of the seventh century with many-sided cutting of life like figures. Wonderful Design and Prototype, I like this designing process. i am going share this post in my facebook newsfeed. Ooty Car travel and Tour Packages, We provide at very low cost of price. Please don't hesitate to visit our site. 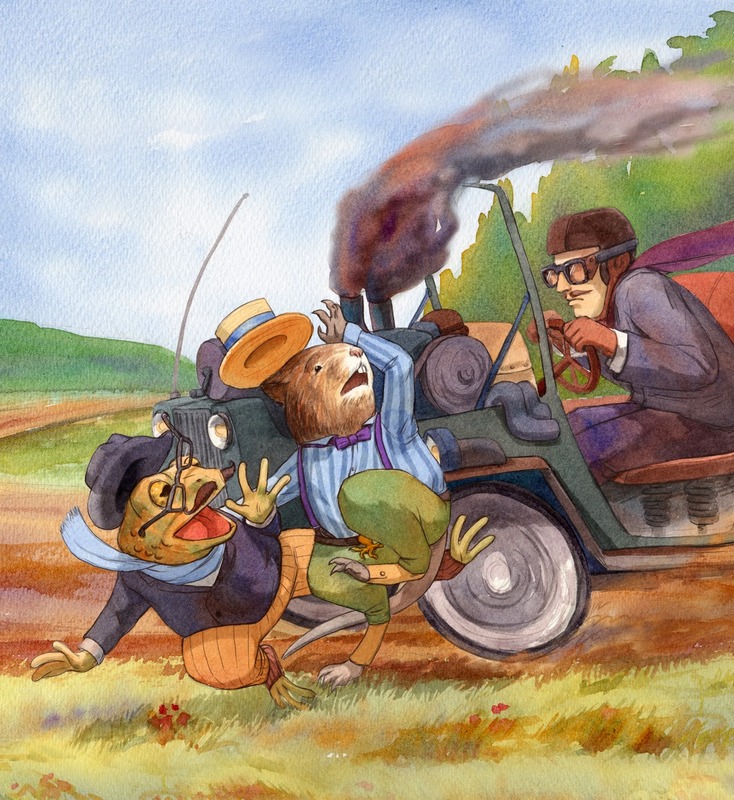 Steam in the Willows is a new illustrated edition of Wind in the Willows by Krista Brennan. Dedicated to all the modern Makers, Artisans, Crafters, Steampunks, Dreamers and True Friends everywhere: this is a tale for our time. All the physical stuff: DONE. Cards and Journals have arrived! Copyright Krista Brennan, 2010. Picture Window theme. Powered by Blogger.